There were 110 participants in total. We wanted to spend "Un giorno con Maria" (a day with Mary) to open to her our hearts and to let her act in them. After 9:30 Mass, we began in the Brignano Oratory, which is the youth center of the parish. 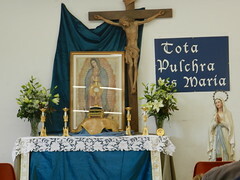 To begin our retreat well, in Our Lady´s hands, we made time for prayer before the Blessed Sacrament, exposed for adoration, dividing ourselves by age groups in the different chapels. The adults´ adoration, led by Father Francesco (the parrochial vicar), lasted almost until the lunch hour, while the children and youth, after their time of prayer, played a little bit in the freshly fallen snow. 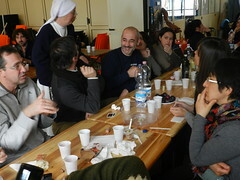 During lunch there was a very good atmosphere, getting to know each other, sharing stories and laughing a lot. It seemed that no one wanted to get up from the table. In the afternoon, the children watched a movie about Our Lady of Lourdes and during craft time made some Styrofoam fish that were used later to play a fishing game with prizes and candy included. The adults and the youth got together for a talk about the story of Our Lady of Guadalupe, which in Italy is almost unknown. Sister Isabel Cuesta explained the significanceof the image of Guadalupe according to the symbols of the Mexican Indians. She explained how Our Mother, through her image on the tilma of Juan Diego, taught them in a manner that they could understand, helping them to accept the faith. 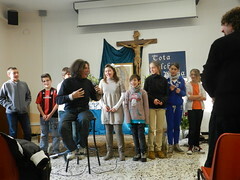 Afterwards, we had the opportunity to listen to Robert Bignoli, a famous Christian singer from Milan, give his testimony. The conviction and the love of this convert for Our Lady, shown through his testimony and some of his songs, touched the hearts of all who heard him. Many returned home convinced of the necessity of doing more apostolate. At 4 o’clock we ended the day so that the participants had the opportunity to attend Mass in "Madonna dei Campi", a Marian shrine in Brignano. The day ended with the joy that comes from having dedicated a whole day to live as family with Mary.